TMSA committees develop and manage many critical programs and initiatives that advance the organization's mission and success. These industry leaders are responsible for the tactical direction and activities that provide value to our members in the areas of education, communications, recognition, and membership development and engagement. 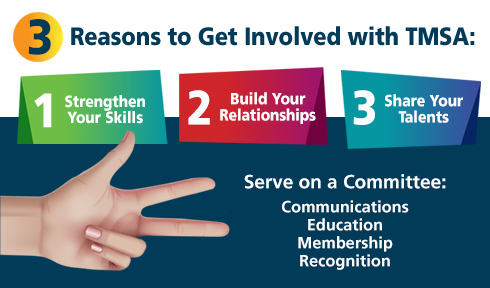 Getting involved is one of the best ways to enhance your membership experience! If you are interested in joining a committee or would like more information about leadership opportunities, contact TMSA Headquarters at 952-466-6270, ext. 201 or email.